A stump grinder is a engine powered machine that consists of a large heavy spinning disc with carbide tipped cutting teeth on either side. This disc spins at 1350 rpm to grind away at the stump as it moves in an arc from side to side. Eco Tree Care & Conservation had a Carlton SP4012 which is a large stump grinder which can grind out large stumps quickly and efficiently. It is radio controlled allowing the operator to position themselves in such away that they can gain a good vantage of the grinding operation which helps when the stump is being removed near walls, fences or other obstructions. The Carlton Stump Grinder is self propelled and does require an access width of 900mm minimum, therefore it is only suitable for some applications where access is good. 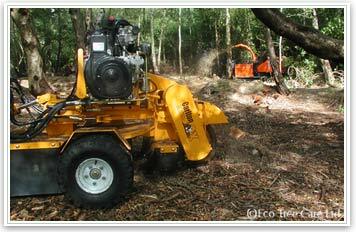 Where access is restricted or the stump is relatively small, a smaller hand-operated stump grinder can be employed. This machine is small enough for two operators to lift it up steps and over low walls or raised beds. When to remove stumps using a Stump Grinder? We advocate retention of stumps where they can be left to rot away naturally. The buried wood mass is fantastic habitat and can become home to generations of invertebrates and different fungi as the stump decays. 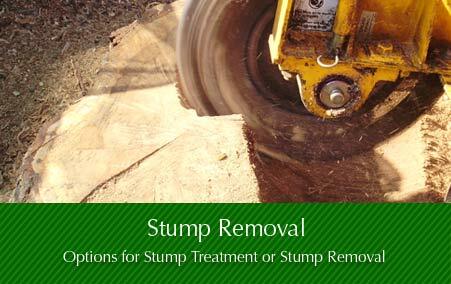 However stump removal is very often necessary in domestic situations and in public areas. Tree Species, Stump Grinding and Suckering. There are some species of tree which can be problematic when attempting to remove them as they are particularly good at regenerationg from cut stumps and some also send up shoots from the roots (suckers). The knowledge of trees being able to regenerate from cut stumps is behind our relationship with woodlands managed as coppice. However for the 'wrong tree in the wrong place' or an unwanted stump of certain tree species the permanent removal can be less than simple. Some trees when they are felled will not regenerate from the stump or roots this is true for most conifers. Many broadleaf trees will regenerate from living stumps unless they are mature trees. Below is a list of genus and species of tree and their ability to survive from cut stumps and the implication that this has on stump grinding and stump removal. The letters in the table below reference to the following keys. Will regenerate, will grow from cut Stump? Treat with an appropriate herbicide, then ideally leave for 2-3 months before using stump grinder to remove stump and major roots. May require repeated herbicide treatment and repeated visit with stump grinder to eradicate. Stump can usually be killed using an appropriate herbicide, but may take repeated applications. Alerternatively removing the stump by stump grinding should be sufficient to kill any remaining roots. Stump may not regenerate, especially if the tree is mature. Therefore avoid using unnecessary herbicide unless the stump does regenerate and then use sparingly as the stump should be easily killed using an appropriate herbicide or by removal by stump grinding. Stump will not regenerate therefore stump can be left or if removal is required then simple stump grinding will be sufficient. No herbicide necessary. Will grow from cut stump? Some may question our 'green' credentials when we suggest the use of chemical herbicides to kill unwanted stumps. On occasion, for some tree species, in certain situations the use of herbicides will almost always be necessary if the stump is to be killed quickly. If the owner of the stump has the time and commitment necessary it will be possible to kill a stump by over time depleting it's energy resources.